I have put my brushes aside for the moment for the opportunity to participate in some community service very dear to my heart. 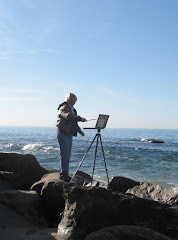 We have a growing population of homeless folks all over the country; and here in Laguna Beach, some of the people without a roof are fellow artists and wonderful people. We have just now been able to open our first emergency homeless shelter here in Laguna Beach; but there is still much work to be done to get us all out of the rain. I'm sure that I will be back slinging paint again very soon....til then, keep me in your prayers.